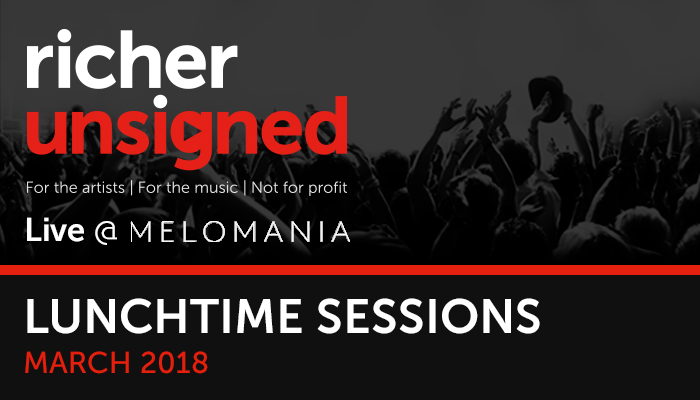 As March drew to a close, we ended the month on a high note with yet another smashingly successful Unsigned Session at Cambridge Audio’s Melomania event space! We had two more incredible acts hit the stage, showcasing fantastic talent and brilliant songwriting, selected from our Best of March playlist curated by Believe Distribution Services. Rounding out the afternoon we had a performance from Tom Dunne. The decision to be a music maker was a bit of a last minute one for Tom, who had been on a path towards academics when a friend convinced him to change paths, taking a four-year course in Popular Music Performance, which he is just on the cusp of completing. Tom was recently selected from the Richer Unsigned pool of artists to perform at Believe’s Alternative Great Escape Festival stage in May, which we are extremely proud of! We asked Tom if he thought what we do with our Unsigned platform is valuable to artists: “Definitely. There’s so many people in the middle who try to take a cut, which can be frustrating at times because it can be a barrier between your end goal.” Tom and his band well and truly brought down the house with their Unsigned performance! With a sound that is equal parts smooth R&B and up-beat jazz cool, it’s little wonder why Believe selected Tom to grace their festival stage! As always, a big thanks to all the music fans who flocked to the venue for this intimate event, we love seeing music fans connecting with new and exciting music. See you next month!